447 Luna Tower reached the sixth phase of construction with completion of the parking levels in April 2018. At 45-storeys high, with 190 upscale apartments, located in the heart of Colombo, it is a match for any of its competitors, but where it truly stands out is when you start to look deeper. The building now has reached the 35th level which consists of the two, three and four bedroom apartments; hard hat tours of the location and apartments are being carried out, so clients could have a first-hand experience of their new home. In enlisting PWA as the Principal Architects – a firm that boasts an array of upmarket hotels and minimalist designer homes in their portfolio – 447 Luna Tower has differentiated itself through a coalescence of enchanting aesthetics and well thought-out functionality. By then adding two global giants – Arup and Ong & Ong – to the mix, 447 Luna Tower has also spared no cost in its goal to create a true contemporary urban oasis at Union Place. Arup, of course, is an international leader in structural engineering that will look to bring a world class depth of creative and technical expertise as they provide a thorough structural review of the apartment complex, while Singaporean firm Ong & Ong – operating in 13 countries across three continents – offers unrivalled know-how in cross-discipline and integrated design solutions. In terms of primary objectives, with the apartment sizes ranging from 842 square feet two-bedroom, to an expansive four-bedroom 2283 square feet variant, the main goal was to maximise the general living areas as much as possible. This was particularly crucial as over 70% of the apartments are from among the two bedroom variants. In that sense, areas which generally take up additional amounts of space – such as the kitchen and bathrooms – have been laid out in a supremely efficient manner through the use of smart plumbing and wiring. In the case of the bathrooms, premium Marazzi bathroom tiles complete with Hansgrohe and Duravit fittings ensure a high quality finish across the board, while the German made kitchen area sees room for all the essentials – fridge, oven, and stove – with finishes that provide durability as well as style. Burma teak flooring is prevalent across the property, while a conscious decision was taken to ensure that none of the bedroom doors open directly into the living area, offering maximum levels of privacy. All of this allows for some of the most substantial living areas in Colombo’s condominium sector, spaces which are made even more visually appealing by double-glazed windows which resonate throughout the apartment, alongside annexed balconies overlooking Colombo’s transcendent skyline. This is the first of many projects to be undertaken through the Asia Capital and Belluna alliance. Other projects include a 300-room city hotel on Marine Drive in Colombo 3 which is currently under construction; an ultra-luxurious 57 room resort in Galle which opened in August 2018; as well as their first resort endeavour with Marriott International, debuting the ‘Westin Maldives Miriandhoo Resort’ entailing 70 villas opened in October of 2018. 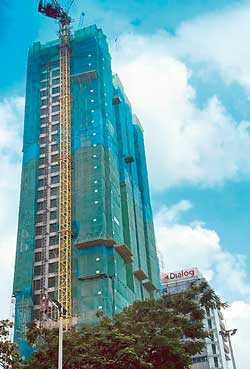 Belluna Co. Ltd., Japan’s long term plans with Asia Capital PLC reiterate the company’s confidence in Sri Lanka’s growing real estate industry.